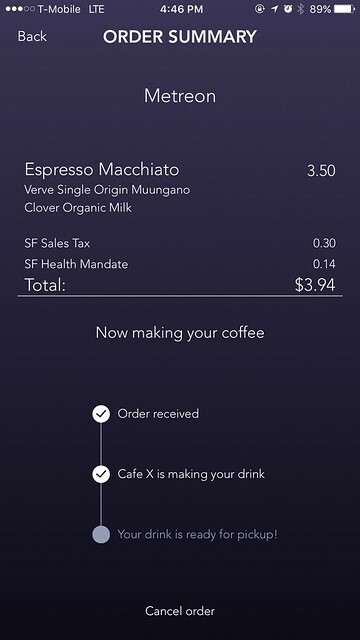 A while back I visited Cafe X in San Francisco’s Metreon only to find its robot barista charged me for health care. I thought for sure the novelty would wear off quickly, but it seems every time I’m at the Metreon there’s still a bunch of people gawking at the robot arm shuffling cups around. I’ve even ordered a couple more times myself when I was too desperate for coffee to wait in Blue Bottle’s notoriously long line. But still, I never expected to see another Cafe X robot barista. Well, I was wrong. 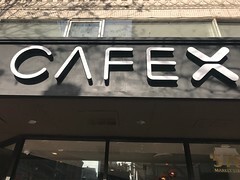 Last night as I headed home I noticed something unexpected: a new Cafe X location at a small storefront on Market Street near Second Street. Despite walking by frequently somehow I hadn’t noticed the signs going up. I peered in the window and sure enough, there was the robot, sitting still, waiting for an order to be placed. A paper sign on the window indicated the grand opening was the following day. Fast forward to this morning and I decided to stop by and grab a coffee on the way to work. The place was busy, but I breezed through the gawking crowds, fired up the Cafe X app on my phone, and ordered a cappuccino. A few moments later the robot arm gave me my coffee and I headed to the office. Yes, yet again a robot charged me for health care. Perhaps it’s time to embrace our future of robots and spurious surcharges. Robots are handling food everywhere these days. Whether delivering falafel or attempting to scoop ice cream, there’s no escape from food robots in the Bay Area. All of which is fine with me: I, for one, welcome our new robot food service overlords. What I’m not fine with, however, are spurious surcharges. 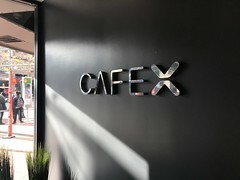 So imagine my surprise when I paid a visit to Cafe X, the robot coffee machine at the Metreon, and found a small surcharge on my bill for health care. While it’s not uncommon for San Francisco restaurants to add a surcharge for Healthy SF, a local subsidized medical care program for those without health insurance, this is the first time a machine has charged me such a fee. Yes, I realize human employees maintain this robot. But if you think about it, Cafe X is nothing more than a fanciful vending machine. You put money in, make a selection, and a product comes out — that’s it. All vending machines require humans to restock it, clean it, etc. but when was the last time you went to buy a Coca-Cola from one only to find that your 99 cent beverage actually cost $1.10 because of a surcharge? Never, that’s when. It also makes me wonder if the economics of this robot food service industry are really working out. 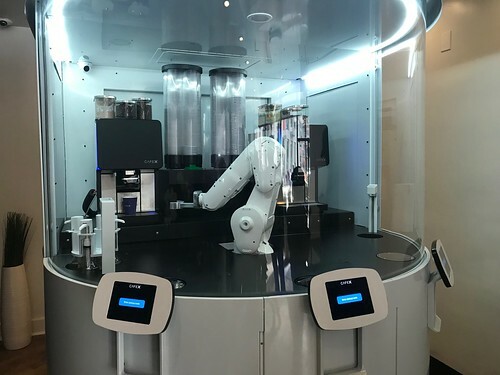 The “robot” part of Cafe X is an off-the-shelf robot arm custom programmed to move cups around, the coffee beverages themselves are prepared by off-the-shelf automatic espresso machines. If Cafe X has to nickle and dime customers to the point where the prices are in line with Blue Bottle, why wouldn’t I go to Blue Bottle instead? It’s barely a block away, and to be honest their humans not only make better coffee, but they don’t charge an extra fee for health care.